The United States holds 75% of the world’s gold reserves, although demand is significantly higher in Turkey, India and China. Learn all about gold and the pros and cons of investing in this commodity. The price of gold is always a hot topic. This precious metal is not only aesthetically desirable, but monetarily valuable–especially in recent years. But does gold make a good investment or is it a waste of time and money? How has it performed domestically and globally? There are 33 tons of gold in the United States, but only 15 tons of that has been found. That leaves 18 tons of undiscovered gold waiting to be mined in this country alone. On a global scale, the demand for gold jewelry has risen 34% year on year, while the demand for investment has fallen 37%. 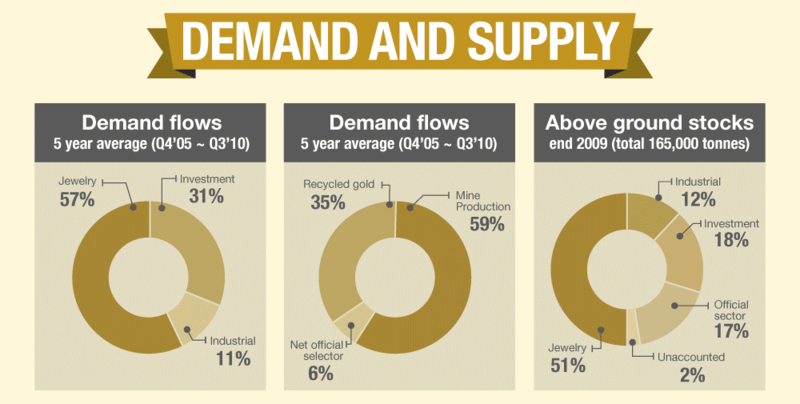 The current volume demand is 17% below what it was in Q2 2010, but that doesn’t mean it’s negligible–current demand of gold jewelry is 442 tons, while demand for raw gold is more than double that at 920 tons. Gold Demand: Whose Buying It? Fully half of the worldwide demand for gold is accounted for by three countries: Turkey, India, and China. These countries primarily use gold for making jewelry. India represents 38% of the consumer demand growth in recent years, while China accounts for ¼ of it. Together they are 52% of the end-user investment globally. The demand for gold in China has risen from 200 tons in 2001 to over 600 tons in 2010. The current demand is about 200 tons more than China has available. In contrast, the demand for gold jewelry in the US has fallen In recent years, partially due to the poor economy. Recycled gold has accounted for about 35% of the world market between Q4 2005 and Q3 2010–proof that passing on that unwanted gold could do good things for the overall supply. In the U.S., shops that buy used gold have seemingly popped up on every corner. In 2011, the price of gold peaked at $1,920 per ounce–in some cases its value superseded that of the consumer price index. If the US dollar were to crash, experts predict the price of gold would skyrocket, as it would be considered a stable investment. However, if gold took a value hit, the US dollar and the NASDAQ would likely rise. The United States has the highest percent of global reserves, with 75%–8,133 tons. China, with its huge demand, has just 1.6% or 1,054 tons of gold. Between 2009 and 2010, the production of gold mining domestically rose 3%–this was the first rise since the year 2000. New mines in Alaska and Nevada contributed strongly to this boost in the United States gold mining industry. However, the USA is fourth in global gold production; China is the leader. If you’re looking to invest in gold, remember that buying gold bars is nearly always preferred over gold coins, and that the larger the gold bar, the lower the cost by weight. Experts believed that it would rise to about $2,000 per ounce in the coming years, yet it seems to have peaked at just over $1,800 in 2011. As of mid-2013, just over $1,200 is the going rate.